Between 1 December 2016 and 31 January 2017 651 suspected cases and 127 confirmed cases of yellow fever have been reported in Brazil. Of all reported cases, 125 have resulted in deaths. This outbreak is the worst to affect the country since 1980. Between 1 December 2016 and 31 January 2017, 651 suspected cases and 127 confirmed cases of yellow fever have been reported in Brazil. Of all reported cases, 125 have resulted in deaths.? Case fatality rate was last reported at 55% among confirmed cases and 14% among suspected cases.? Case fatality rates for reported cases generally vary between 15-50%.? 221 suspected cases and 10 confirmed cases were reported between 30 and 31 January alone.?? Only six of all confirmed cases were reported in 2016: three in the state of Goias, two in Sao Paulo and one in Amazonas. The case fatality rate among the 2016 cases was 71%.? The current outbreak is the worst to affect the country since 1980, with 20 times more confirmed cases between 2016 and 2017.???? Minas Gerais is the most affected state.? Local media suggests that reported cases in this state have surpassed 700.?? Minas Gerais has also reported 114 of the 125 yellow fever-related deaths.? So far cases have been largely reported among farmers. However, affected areas are close to major urban centres in Brazil, including Sao Paulo, which has nearly 12 million inhabitants in its urban area.? Yellow fever has not been reported in urban centres in Brazil since 1942.? Vaccination is available in the public health system. However, it is only recommended in areas with risk of transmission, generally near rural areas, and to people traveling to high risk areas abroad, despite the ongoing outbreak of the disease.? ? The Ministry of Health offers a list of municipalities where vaccination is recommended. With the exception of Belo Horizonte, the capital of Minas Gerais and Palmas, the capital of Tocantins, none of the major urban centres in the states currently reporting cases of the disease are included on the list.?? The introduction of the virus into urban areas may severely impact the system’s ability to provide vaccination for the affected population, despite the high numbers of vaccine produced in the country.? Additionally, Brazil does not require travellers coming into the country to present an international certificate of yellow fever vaccination. People currently travelling in forest or rural areas in Brazil are at risk of contracting the virus, which may cause the disease to spread to other countries, including those in regions where national vaccine stocks are low or inexistent.? Only 48% of people living in rural areas have access to improved sanitation facilities.? The accumulation of water favours the proliferation of mosquitoes, which is likely to impact on the government’s ability to contain the disease outbreak. Should the disease reach urban centres, populations living in slums and suburban areas, where access to safe drinking water and sanitation is limited, will be especially vulnerable. Oswaldo Cruz Foundation (FIOCRUZ), located in Rio de Janeiro, is the world’s largest producer of yellow fever vaccine and has broken its production record, with nine million doses of the vaccine in January.? Private clinics may however not be able to keep up with demand, despite Oswaldo Cruz’s production: Sao Paulo reported a four-fold increase in demand for the yellow fever vaccine in January.? On 31 January, stocks of the vaccine in all 371 private hospitals and clinics were declared exhausted.? Yellow fever is an acute viral haemorrhagic disease transmitted by infected mosquitoes, and is endemic in South America. The "yellow" in the name refers to the jaundice that affects some patients.? Symptoms also include fever, headache, muscle pain, nausea, vomiting and fatigue. Roughly 15% of cases progress to develop into a more severe form of the disease and approximately half of those die within 7 to 10 days.?? 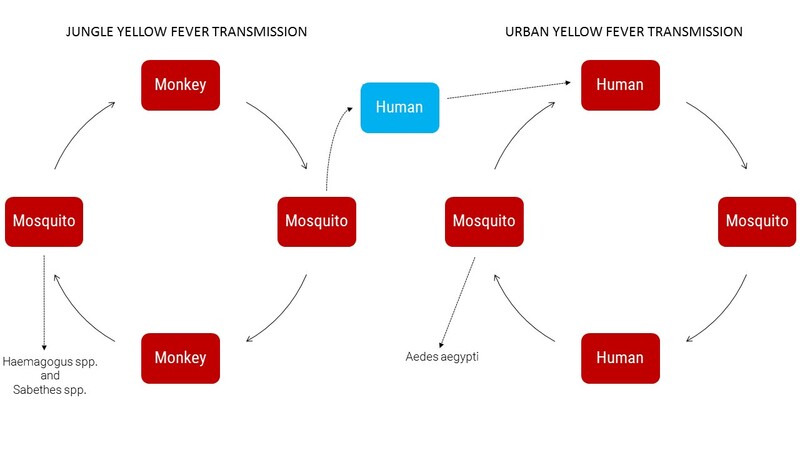 The jungle (sylvatic) cycle of yellow fever involves transmission of the virus between non-human primates, typically monkeys, and mosquito species found in the forest. The virus is then transmitted by mosquitoes to humans when humans are visiting or working in the jungle.? The urban cycle of yellow fever involves trans­mission of the virus between humans and urban mosquitoes, primarily Aedes aegypti. The virus is usually brought to the urban setting by a human infected in the jungle (or savannah).? No specific anti-viral drug for yellow fever is available. However, specific care to treat dehydration, liver and kidney failure, and fever generally improves outcomes?Associated bacterial infections can be treated with antibiotics.? A highly effective vaccine against yellow fever is available and is recommended for preventing outbreaks. The vaccine is safe and affordable. A single dose of yellow fever vaccine is sufficient to provide life-long immunity.? Infants aged under nine months are usually excluded from vaccination. An exception can be made for infants in areas with high risk of infection. The same rule applies to pregnant women. Also excluded from vaccination are people with severe allergies to egg protein or erythromycin, a type of antibiotic, people with severe immunodeficiency (e.g. due to HIV/AIDS), including patients with autoimmune diseases, such as disorders associated with the thymus organ.?? In 2015, nine cases of jungle yellow fever were confirmed in three Brazilian states: Goias (six), Para (two), and Mato Grosso do Sul (one). The case fatality rate among these cases was 55.5%.? The urban yellow fever vector, Aedes aegypti, is highly present in Brazil and is also responsible for the transmission of other diseases such as dengue, Zika and chikungunya. By 5 November 2016, 1,496,282 suspected cases of Dengue had been reported, compared to 1,677,013 for the same period in 2015. For Chikungunya 2016 suspected figures stood at 265,554 by 5 November, compared to 38,240, showing an increase of approximately 600%. The Zika outbreak was declared in Brazil in 2016. By 5 November, 214,193 suspected cases had been reported.? The current yellow fever outbreak is taking place in an area with relatively low vaccination coverage, which could favour the rapid spread of the disease. 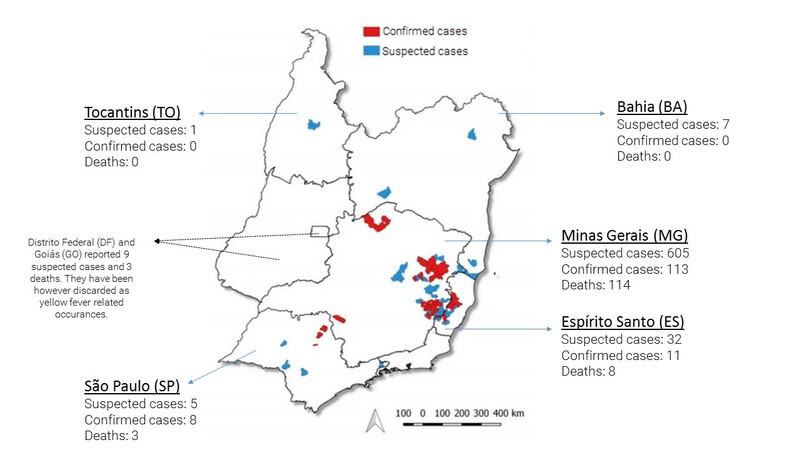 Despite the state of Espirito Santo and the south of Bahia having favourable ecosystems in rural areas for the transmission of yellow fever, the urban areas of these states were previously considered to be at low risk of transmission and, consequently, vaccination was not recommended. The introduction of the virus in these areas could potentially trigger large epidemics of yellow fever.? The incidence diseases transmitted by the aedes aegypti mosquito, also responsible for the urban transmission of yellow fever, typically occurs between January and April. Should yellow fever cases transition from jungle to urban within this period, cases could spike significantly. ?